This EIT 171 image shows a wide variety of loops and active regions (lighter areas on the surface). Taken on November 9, 1998. 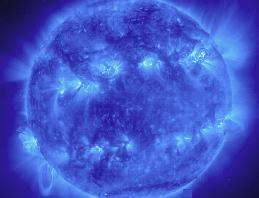 The 171 filter shows emission from 8 and 9 times ionized iron at about 1 million degrees C.